From British journalist Cliff, a lapidary chronicle of a drama turned deadly: the 1849 brawl in front of the New York’s Astor Place Theater that resulted in more than 20 deaths. The immediate cause assigned to the mayhem was conflict between the robust American style of performing Shakespeare and the daintier English approach. But there was more to it, Cliff demonstrates in his debut. The works of the Bard were part of America’s popular culture, familiar to all. Favored performers boasted fans to rival those of any modern day rap or rock artist. Forceful American Edwin Forrest, “The Native Tragedian,” was a studly heartthrob. Acutely sensitive Englishman William Charles Macready, “The Eminent Tragedian,” practiced more thoughtful interpretation. These dueling thespians appealed to disparate classes in national society. The kid-gloved swells appreciated Macready’s effete English mode of acting, while plebian nativists favored Forrest’s hearty American take. Their fanatical supporters caused the stars, once quite fond of each other, to become acting enemies. In the fateful spring of 1849, as the touring Macready arrived in New York, they scheduled conflicting performances of Macbeth, a signature role for both. Vowing to rout the fancy Englishman and his clique, the city’s feisty Bowery b’hoys and hustlers took to the streets, and the tragedy was played out. Cliff skillfully portrays the successes, failures and feelings of the lead actors, as well as a supporting cast that includes Charles Dickens and rascally dime novelist Ned Buntline. High drama prevails right up to the final curtain. 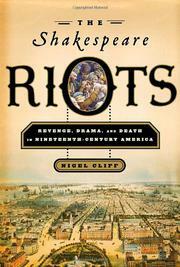 First-rate social and theatrical history combined with a dash of Shakespearian critical appreciation: a noteworthy story.